If there was ever evidence of my incessant complaining having any sort of pull in this universe, it would be when the strip mall Indian joint appeared in this otherwise dull and flavorless town. Harsh, I know. But it’s true. In the months since it opened, James and I have eaten at that Indian restaurant… ah, more times than I care to count. Eventually it got to the point where we literally had to set hard limits on ourselves for the sake of our bellies and our budgets– we agreed to indulge once a month. Although in reality, I guess those “hard limits” weren’t so hard after all, since we soon started finding excuses to fit in extra visits. What can I say? We’d become entirely infatuated with the garlic-brushed naan, the spicy lamb vindaloos, the salty pickled vegetables, and the fragrant jasmine rice. And of course, at the very tippy-top of our long list of obsessed-over dishes, there sat tandoori chicken. 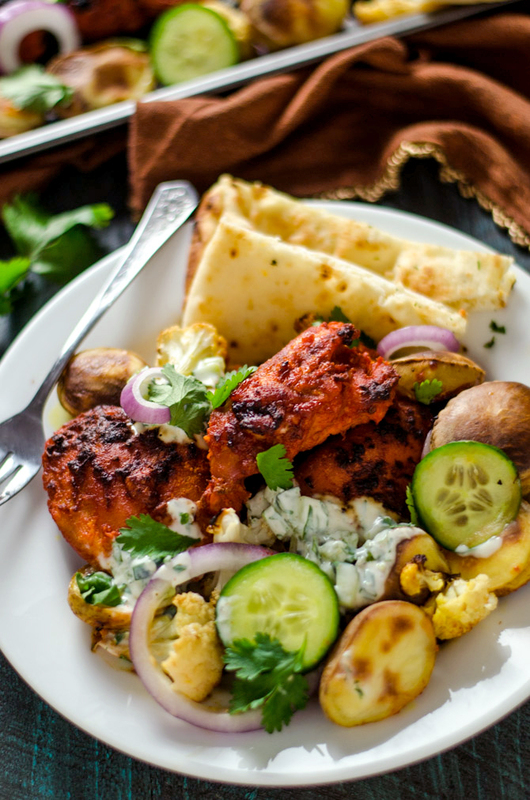 Tandoori chicken, in case you haven’t had it before, is a popular Indian roasted chicken dish. It involves marinating the chicken in yogurt and spices, and then cooking it in a clay oven called a tandoor. Tandoor, tandoori chicken. You got it. In an effort to hold James and I over between our monthly feasts at the Indian restaurant, I got the idea to try making tandoori chicken and at home. 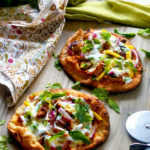 Well, not technically tandoori chicken (because I had no intention of cooking it in the aforementioned tandoor), but as close as I could get for a simple weeknight recipe. And how much easier could it get, I thought to myself, than roasting everything together on one big ol’ sheet pan? 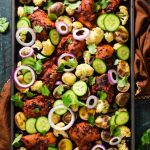 Something like Sheet Pan Tandoori Chicken & Vegetables? As I debated whether or not the recipe would work, I found Deb Perelman’s Sheet Pan Chicken Tikka. Clearly, this was a nod of approval from the food blogger deities. If Deb was down with it, then I was too. 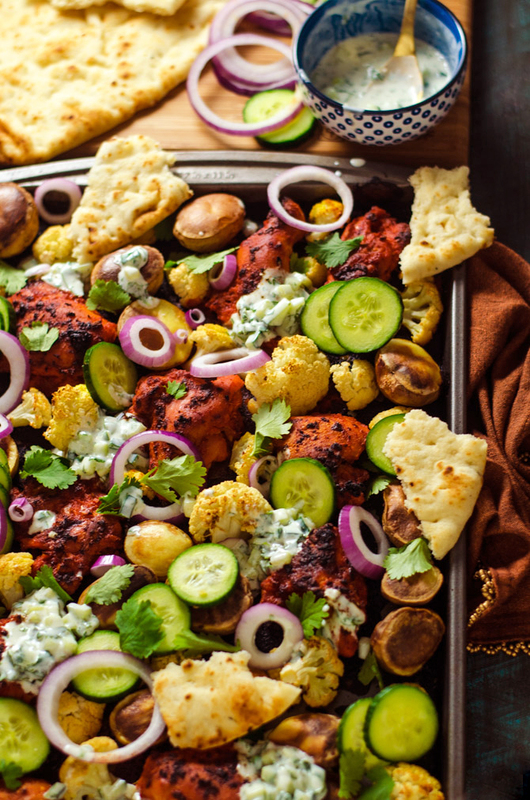 Mark my words when I say that there will be people who are outraged at the idea that I’d name this “Sheet Pan Tandoori Chicken & Vegetables”. Fair enough. However, thanks to a spice-filled marinade (which I easily whip up in my food processor), the flavor is on point and the chicken gets that signature slight char on the outside while staying moist inside. One could argue that I’m not knowledgeable enough in the nuances of tandoori chicken, but if it counts for anything, this version tastes pretty damn authentic to me. Yes, even though it’s made on a sheet pan. I decided to also fill my sheet pan with cauliflower and potatoes, which are two of my favorite vegetables to roast. 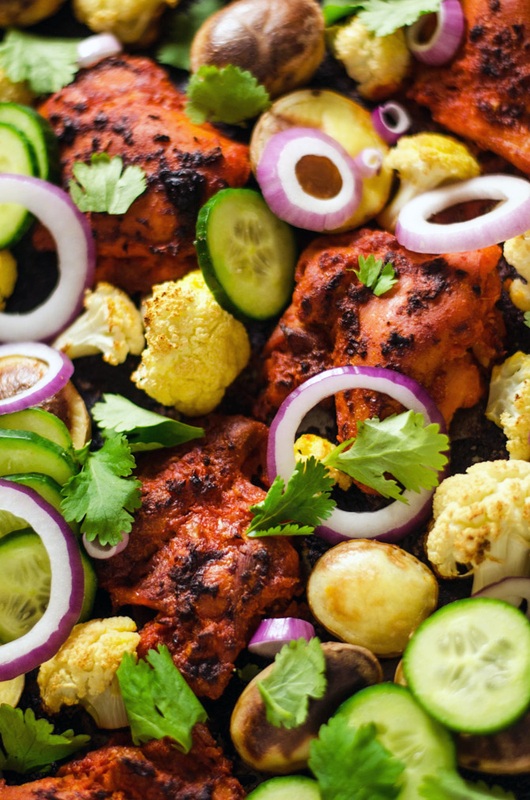 Not only are they generally great candidates for sheet pan recipes, but they also happen to be common in Indian cuisine. Both the cauliflower florets and the halved mini potatoes crisped up beautifully without having to toss them in any oil or treat them specially at all, and they really made this simple dish into a full, satisfying meal. To brighten and sharpen up the flavor of the roasted chicken and vegetables, I took a note out of Deb’s book– er, blog– and included some freshly sliced produce as well. Remaining red onion that isn’t used in the marinade adds some nice contrast, and English cucumber gives coolness and freshness to the dish. If sliced cucumber isn’t your thing, feel free to leave it off, but I still highly recommend including the chopped cucumber in the raita. 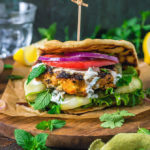 Much like tzatziki (if you’re more familiar with greek food), the raita is a yogurt-based sauce that often includes cucumber and fresh herbs. And much like tzatziki, raita is one of those condiments that you’re going to want to load up on. Especially because it’s super simple to make! 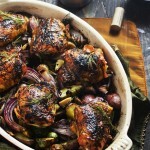 You can actually whip it up in the short time that it takes for the chicken and vegetables to cool before serving. 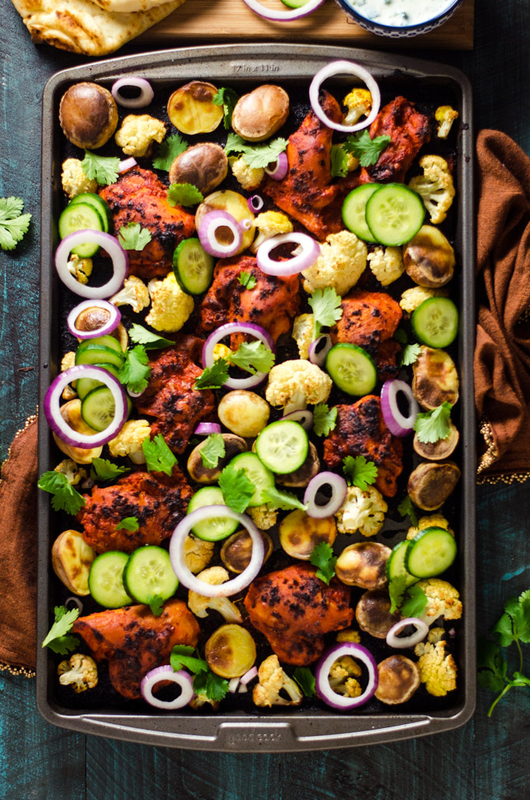 This Sheet Pan Tandoori Chicken & Vegetables is absolutely amazing if you follow the recipe to a T, but it’s also very customizable to your own preferences. So, you know, feel free to swap out the vegetables based off of what you have on hand, or what your family will enjoy! Next time, I think I might try roasting up some chickpeas in place of the potatoes. 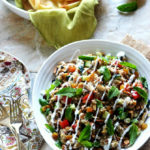 Who doesn’t love some crispy chickpeas? 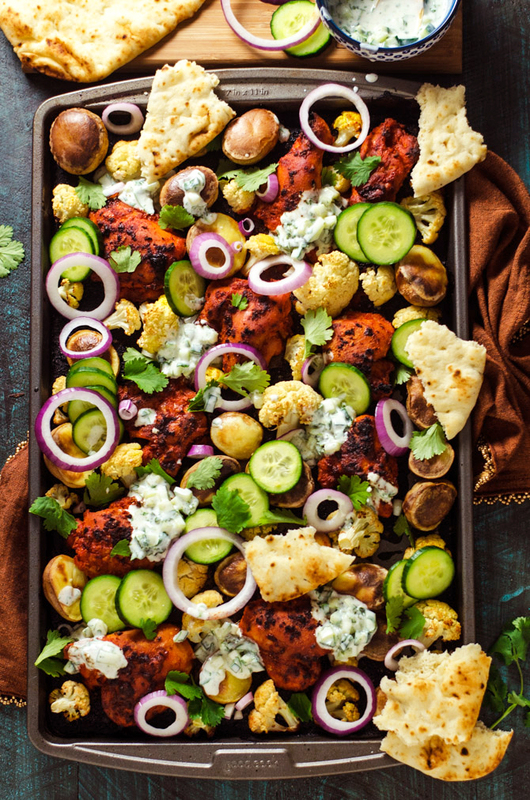 Whether you make it as-is or put your own twist on it, don’t forget to take a picture of the Sheet Pan Tandoori Chicken & Vegetables before serving! 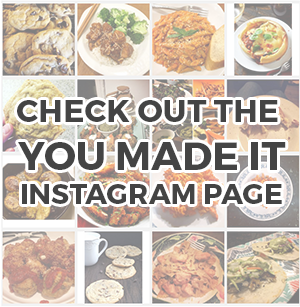 If you post it on Instagram with the hashtag #hostthetoast, it’ll show up on the You Made It page. In the bowl of a food processor, combine all of the marinade ingredients and pulse until smooth and well-combined. Place the chicken in a large, sealable freezer bag and pour the marinade in. Seal the bag use your hands to move the chicken around to ensure that it is fully coated in the marinade. Marinate for at least an hour. Using tongs, remove the chicken from the marinade, allowing excess marinade to drip off. Place the chicken on a large baking sheet. Scatter the potatoes around the chicken. Roast for 20 minutes. Add the cauliflower to the baking sheet and season the potatoes and cauliflower with salt and pepper. Bake until the chicken is cooked through and the vegetables have browned and crisped, about 15-20 more minutes. Let cool for 10 minutes. While the chicken cools, make the raita. Chop 1/2 cup of cucumber. Mix the chopped cucumber in a medium-sized bowl with the yogurt, chopped cilantro, cumin, and salt and pepper to taste. Slice the remaining cucumber. 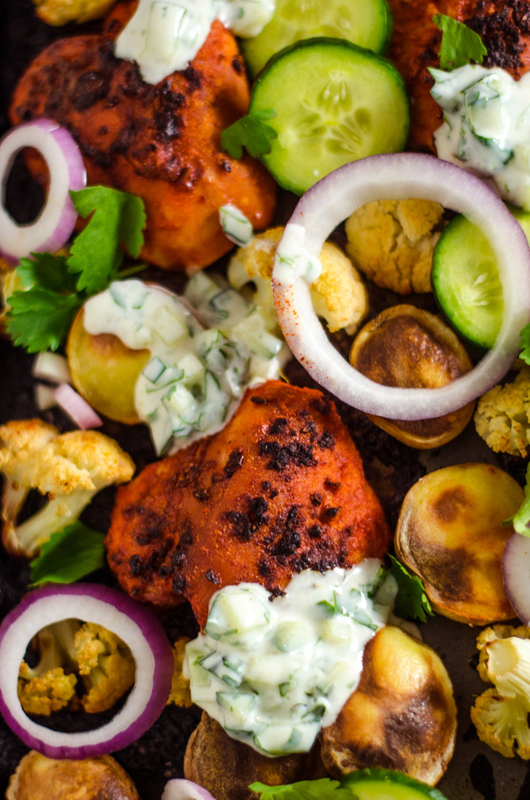 Serve the sheet pan tandoori chicken and vegetables with cilantro, the raita, and naan. Wow Morgan, I don’t think I’ve ever seen vegetables look so good! Love all the spices and sauce. I need this now! I only have bone in thighs. Do out know how long I would have to cook this and would I need to add the veggies later in the cooking time? This looks awesome! How would you adjust if using boneless skinless breasts?